Session headings and selected papers: Error Estimators and Adaptive Computational Methods for Linear Problems. Recovery procedures in error estimation and adaptivity: adaptivity in linear problems (O.C. Zienkiewicz et al.). Modelling Error Estimators and Adaptive Modelling Strategies. Adaptive finite element in elastoplasticity with mechanical error indicators and Neumann-type estimators (E. Stein et al.). Local Error Estimators for Linear Problems. A posteriori estimation of the error in the error estimate (I. Babuska et al.). Error Estimators for Non Linear Time-Dependent Problems and Adaptive Computational Methods. A posteriori constitutive relation error estimators for nonlinear finite element analysis and adaptive control (P. Ladevèze, N. Moës). Adaptive strategy for transient/coupled problems. Applications to thermoelasticity and elastodynamics (D. Aubry et al.). Recovery procedures in error estimation and adaptivity: adaptivity in non-linear problems of elasto-plasticity behaviour (B. Boroomand, O.C. Zienkiewicz). Adaptive Computational Methods for 3D Linear Problems. 3-D error estimation and mesh adaptation using improved R.E.P. method (P. Beckers, E. Defeü). Error Estimators and Mesh Adaptivity for Vibration, Acoustics and Electomagnetics Problems. Error estimation and adaptivity for h-version eigenfrequency analysis (N.E. Wiberg, P. Hager). A posteriori error analysis for steady-state Maxwell's equation (L. Demkowicz). Mastering modelling, and in particular numerical models, is becoming a crucial and central question in modern computational mechanics. Various tools, able to quantify the quality of a model with regard to another one taken as the reference, have been derived. Applied to computational strategies, these tools lead to new computational methods which are called "adaptive". The present book is concerned with outlining the state of the art and the latest advances in both these important areas. Papers are selected from a Workshop (Cachan 17-19 September 1997) which is the third of a series devoted to Error Estimators and Adaptivity in Computational Mechanics. The Cachan Workshop dealt with latest advances in adaptive computational methods in mechanics and their impacts on solving engineering problems. It was centered too on providing answers to simple questions such as: what is being used or can be used at present to solve engineering problems? What should be the state of art in the year 2000? What are the new questions involving error estimators and their applications? 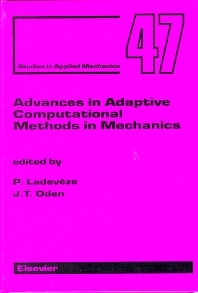 For those with an interest in adaptive methods in modern computational mechanics.